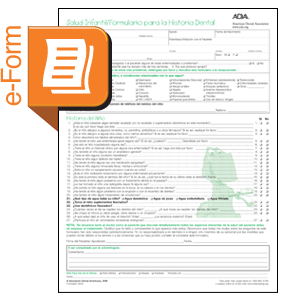 This electronic version of the Spanish-language ADA Children’s Health History Form makes recordkeeping simpler for the dental practice. Just download the PDF document and print—no shipping or handling charges! Or link to the form from your practice’s Web site and give parents the option to fill it out before they visit. Updated edition emphasizes questions on child’s fluoride intake. Also includes new questions related to vitamin supplements and recreational activities.